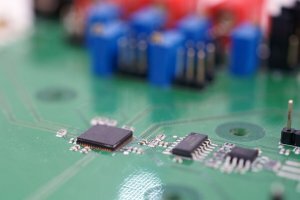 At today's International Solid State Circuit Conference, imec and Holst Centre report a 2.4GHz/915MHz wake-up receiver which consumes only 51µW power. This record low power achievement opens the door to battery-less or energy-harvesting based radios for a wide range of applications including long-range RFID and wireless sensor nodes for logistics, smart buildings, healthcare etc. Test board of imec and Holst Centre's wake up receiver. Today’s battery-operated wireless communication systems consume a lot of power at times when the radio does not have to transmit or receive data. This means that most of their time Bluetooth or WLAN radios on mobile phones are taking energy from the battery without adding functionality. Imec and Holst Centre’s wake-up receiver with ultra-low power consumption and fast response time can be put in parallel with the conventional radio to switch it on when data needs to received or transmitted. Imec and Holst Centre developed an innovative radio architecture based on double sampling to overcome the 1/f noise problem. This noise affects most low data rate (10-100kbps) radios. As a consequence, these radios traditionally have a higher power budget than higher data rate radios achieving the same performance. By using a double-sampling technique the offset and 1/f noise is reduced and consequently the sensitivity of the receiver improves proportionally as data-rate scales. The wake-up receiver chip was implemented in a 90nm digital CMOS technology and occupies an area of 0.36mm2. Measurements on silicon show a sensitivity of -75dBm (SNR>12dB) for the 915MHz receiver at 100kbps OOK (on off keying) modulation. When scaling the data rate to 10kbps and filtering the out-of-band noise, the sensitivity is improved by 5dB. For the 2.4GHz receiver, the sensitivity is -64dBm and -69dBm for 100kbps and 10kbps data rate respectively. “Within our wireless autonomous sensor system research, we aim to develop wireless sensor systems powered by energy harvested from the environment instead of using batteries. The power budget of such systems is only 100µW for the DSP, radio and sensor. This ultra-low power radio of only 51µW with small form factor is a major step forward to achieve our goal. It opens the door to many new battery-less applications such as long-range RFID, smart lighting, and sensor tags.” said Bert Gyselinckx, general manager imec the Netherlands at Holst Centre.